The past few years have seen an explosion in craft brewing in Yorkshire, with small breweries popping up everywhere, producing a wide range of styles of beer, beer of real character and quality. This revolution in brewing has left Yorkshire with 123 breweries, but without its biggest, most iconic brewery, after Carlsberg pulled the plug on the Tetley brewery in Leeds city centre. This is an important point, and it felt like a tipping point in regional brewing when the closure happened in 2011, one of those earth-shaking, confidence-knocking events that cause people to ask questions, to doubt themselves. There was no need for such worry. Those 123 breweries were alive and well in the background, and the loss of Carlsberg’s shadow seems to have freed them to be more active, more adventurous, more … Yorkshire. Today, Yorkshire beer stands out as world-leading craft beer, with innovative and exciting breweries dotted all over the counties. There are simply loads of them, and locally produced beer is available everywhere from the pub to the aisles of the local mega-corp supermarket. , tackles the state of the Yorkshire beer industry head-on, taking a joyous tour around thirteen Yorkshire breweries, telling their stories, their tales of adversity and success, of hard work and quiet triumph, interspersed with recipes for the type of food you’d want to pair with a decent beer – calamari, fried onion tart, cheese and mustard scones, that sort of thing. 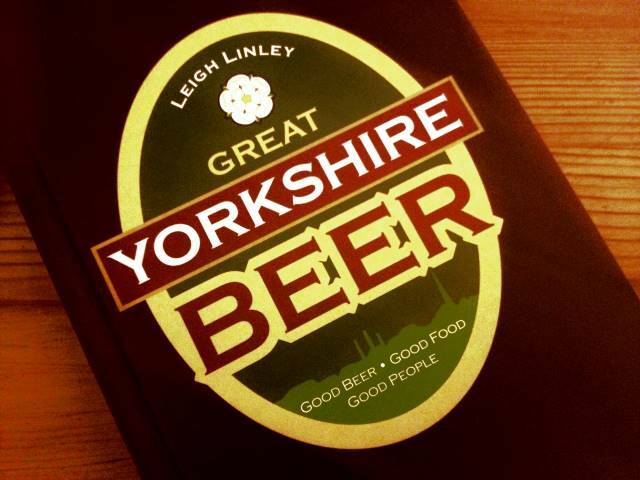 There are essays on big-names in the Yorkshire beer market, such as Leeds, Ilkley and Saltaire Breweries, Magic Rock, Roosters, Revolution, among others, with tasting notes and food pairings for each of their best known beers, but it’s the voice of the brewers that shines through the pages of this book most strongly, the risks they’ve taken to get their beer made and on sale, the gambles and the ambitions. …or by this time next year, given the burgeoning popularity of beers like Leeds Pale or Midnight Bell in the city, but Moss’ words betray an ambition that’s reflected in the pages of Great Yorkshire Beer, an ambition to be celebrated and nurtured, which is exactly what this book does. The brewer himself might make light of his ambition, but behind the joke, there’s a steely determination common to many brewers and breweries … these are hard times for any business, and only the very best survive by doing the very best they can. Leigh started writing about beer as a blogger, and his blog, The Good Stuff, was an enormous influence on me as I started out on this blog. I’d discovered The Good Stuff a few months before I set out with this blog, and the easy style and enthusiasm grabbed me straight away. It helped me shape my thinking about the way I wanted this blog to develop, and to say it was an encouragement is a huge understatement. is in many ways the logical extension of Leigh’s blog. It continues the same easy charm, the same informed but informal authority, the same lack of pretentiousness in a niche of writing filled with it. It’s an engrossing book, with an engaging and enthusiastic style, one that proves infectious – I found myself ticking off the beers that I’d tried, and making lists of the ones I hadn’t, which I suppose is part of the point … its mission to open the reader’s eyes to the wealth of brewing that happens in Yorkshire has been a huge success.